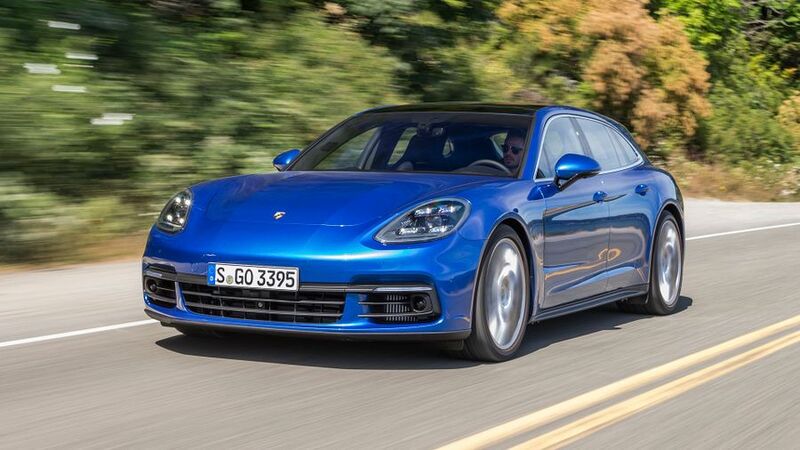 The Sport Turismo is a more practical and, arguably, a more elegant version of the Panamera. 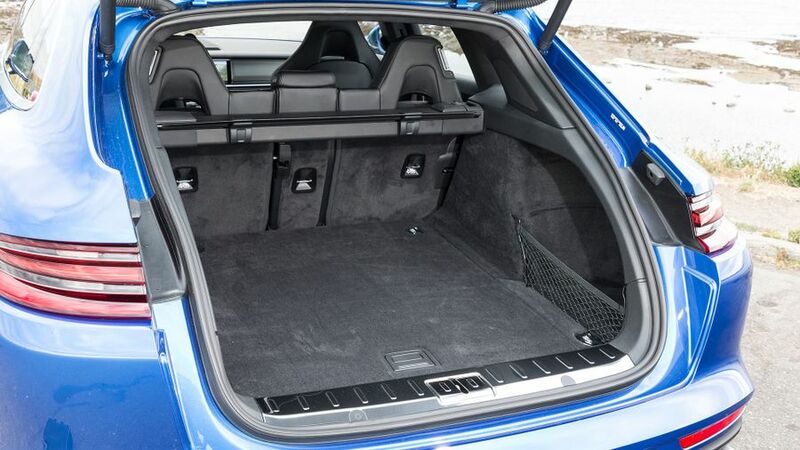 It comes with three rear seats, rather than the two that you get in the standard car, its rear doors are slightly bigger, and there’s a smidgen more rear headroom and a wee bit more boot space. You’ll pay handsomely for that Porsche badge, but you do get what you pay for, including a wonderfully appointed cabin and stellar performance, along with a sublime blend of comfort and an engaging drive. 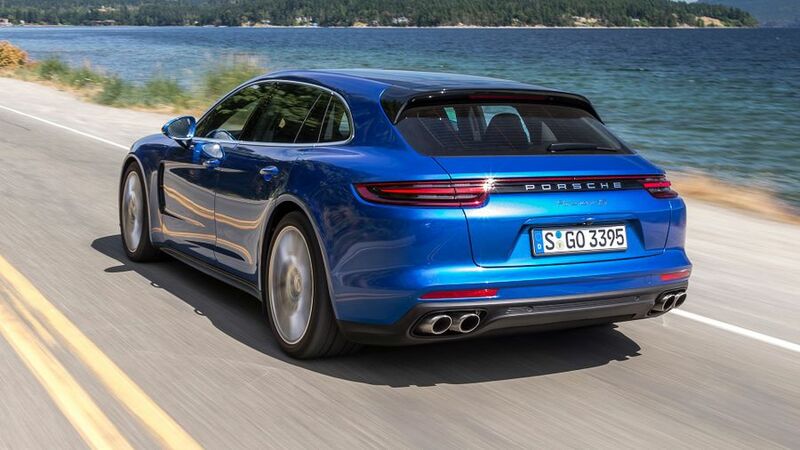 We reckon most folk would concede that the Sport Turismo looks more elegant than the standard Panamera. Whether that’s actually saying much or, in itself, is enough to justify the Sport Turismo’s higher price, we’ll leave to you to decide. 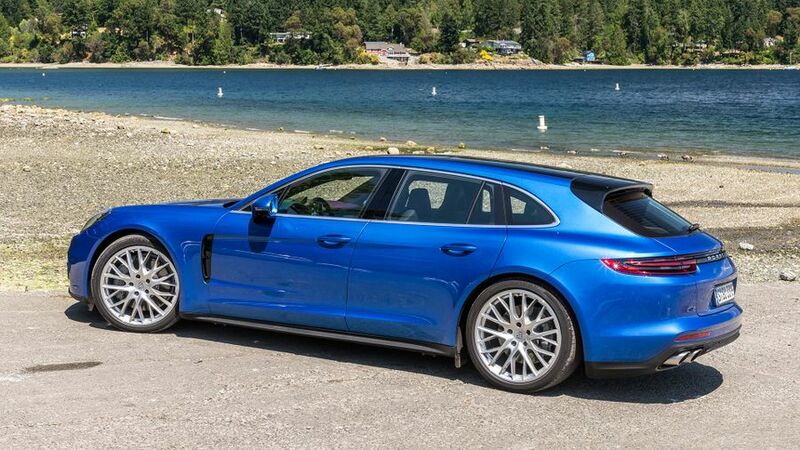 From the nose to the point where the front doors end, the two cars are identical; but, from there, the Sport Turismo looks very different to the standard Panamera. The roof line remains horizontal for longer to provide more rear headroom and the spoiler is mounted on the roof to free up boot space and maintain high-speed stability, even when the sun roof is open. You’ll instantly recognise the two E-Hybrid models because of their lurid green-tinged badges on the side and brake calipers finished in the same colour, but it's not so easy to tell the other models apart. Every model gets alloy wheels, with either 19- or 20-inch rims as standard, and 21s optional; and, while the diesel model gets four round exhaust tips, the petrol Turbo model has a unique front bumper and squared-off exhaust tips. Slip behind the wheel of the Sport Turismo and you’ll instantly get a feel for where your money went. Not only are the cabin’s materials and build quality simply impeccable, the array of stylish displays and wonderfully weighted buttons and switches combine to deliver a real sense of high-end quality. The steering wheel itself is a work of art. Made from the finest materials, it comes with gearchange paddles that operate with silky precision and a couple of neatly proportioned scrollers, which allow you to switch between different driving modes, as well as control the infotainment screen and digital gauges. 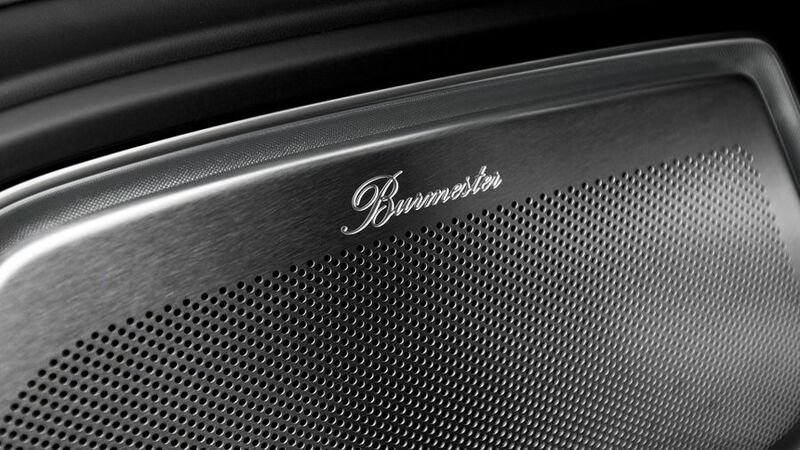 A stylish touch-sensitive panel replaces the more traditional buttons in the centre console. At first sight, when the ignition is off, it looks like a high gloss black surface, but interactive areas reveal themselves on start-up. It certainly looks cool and pulses to let you know you've successfully pressed a 'button'. However, like all touchscreen systems, it’s prone to fingerprint smudges and isn’t as easy or as intuitive to use as BMW’s iDrive rotary controller system. The driving position itself is one of the best you’ll find in this type of vehicle. While the steering wheel sits plumb in line with centre of the driver’s chest, the seats have a huge range of adjustment and sink low to the floor to accommodate taller drivers. Part of the Turismo’s appeal is that it offers three rear seats, rather than the two in the standard Panamera. That said, there is the option to order the Turismo as a two-plus-two, with an armrest between the two rear seats, if you prefer. In reality, though, the three-seat layout provides little benefit, as the centre rear seat is very slim and set higher that the two outer seats, therefore restricting the headroom. On top of this, the huge transmission tunnel that runs down the centre of the car means anyone occupying the middle seat will feel about as comfortable as they would be straddling a seaside donkey. Stick with two folk in the rear, and although the Panamera is clearly no limousine, there’s enough head- and legroom for all. What’s more, because of those larger doors, getting in and out of the back is easier than it is in the standard Panamera. At 520 litres, the luggage space on most models is pretty decent, although the load bay is quite shallow. Thankfully, the rear seats split and fold 40/20/40, if you want to carry longer items. The hybrid model’s boot is narrower again, as some space is taken up to house its electric gubbins. In practical terms, this means you can only carry a golf bag with the rear seats in place if you load it in diagonally. Every Turismo has all-wheel drive and all but the base model ride on adaptive air suspension. On the diesel- and petrol-engined models, it’s an incredibly well-judged set-up, providing prodigious grip, immense high-speed stability and an ability to soak up most lumps and bumps with effortless ease. Should you want to let your Turismo off the leash on a twisty road, its adaptive dampers and a clever anti-roll system stiffen up in microseconds to help keep things flat and stable when cornering. The fact that a car of this size and weight can change direction so sharply is a truly impressive achievement, while the sweetly weighted and flowing character of the steering further enhances the high levels of overall engagement. However, things are very different in the 4 E-hybrid. It's heavier than the more conventional models and that has an enormous impact on how the car changes direction and how well it handles. In comparison to the diesel model, it feels extremely nose heavy, meaning you have to work harder to get the car turning, and the steering feels detached and inconsistent. We didn’t notice such a problem in the range-topping and more powerful Turbo S E-Hybrid however, where things feel more sorted. The Turismo was designed to cross continents with effortless ease, so it’s hardly surprising that is a very quiet cruiser. Wind noise is particularly well isolated and all the powertrains are quiet unless you really start hammering them. Inevitably, on a car fitted with such wide tyres, some road noise is evident at speed, but it’s far from intrusive. The Turismo comes in a few different flavours, including a 4.0-litre V8 diesel, and an enormously powerful twin-turbocharged petrol V8 Turbo. You also have a couple of V6 petrol options as well as two plug-in hybrid, including the range-topping Turbo S E-Hybrid. The diesel-powered car is the best real-world option. As well as being impressively quiet, the negligible vibration, reasonable running costs, and immense low- and mid-range power make extremely light work of the Turismo’s substantial weight. With a 0-60 sprint time identical to that of a BMW M3, if you need more performance than that, you may want to seek counselling. Next to the diesels' effortless performance, the 4 E-Hybrid feels a bit flat. In electric-only mode, the acceleration is strong enough to get you out of most tricky urban driving situations, and Porsche promises a 31-mile range at speeds up to 86mph using battery power alone. Once the petrol engine kicks in, the scenery starts to blur more intensely, but the power delivery never feels as effortless as that of the diesel. As for the twin-turbo V8, let’s just say that, by any stretch of the imagination, it's phenomenally fast. Blessed with prodigious torque and a willingness to rev hard and fast, it fires the Turismo towards the horizon with truly spectacular haste. At the top of the tree, the Turbo S E-Hybrid bolts on electric power to the Turbo version to give even more grunt, although it doesn’t feel quite as ludicrous as it appears on paper. It’s massively fast, sure, but the power isn’t delivered in a manner that will really set the pulse racing, even in Sport Plus mode. If that doesn’t bother you, though, then it’s still a hugely impressive bit of kit. All Turismos come with an eight-speed dual-clutch gearbox as standard and it's one of the best gearboxes of its type. With rapid responses, it hooks up the demands of your right foot without the slightest delay, yet it’s extremely smooth, with only the odd jolt as it changes down a gear to betray the fact that it’s not the type of slushy full automatic gearbox that you usually find in cars at this price. Even in its standard form, the Turismo isn’t cheap; and, by the time you factor in the cost of any extras you fancy, it will be all too easy to push the price into six figures. Servicing at a Porsche dealer will cost a pretty penny, too, even when compared to other luxury rivals, but unless you cover more than 20,000 miles annually, servicing is only required every two years. On the other hand, we expect residual values for the Turismo to be very healthy indeed, which will go some way to offsetting the original steep outlay. No Turismo is going to be particularly light on fuel, and if you drive the V6 petrol cars enthusiastically, you’ll be lucky to see 20-plus mpg. Meanwhile, it’s as well that the Turbo comes with an extra-large fuel tank, as working that particular beast hard will empty tanks of super unleaded at a properly alarming rate. If you’re running one of these as a company car, then the 4 E-Hybrid makes the most sense from the point of view of tax. It promises good fuel consumption, but only if you drive regularly in electric-only mode, and the low CO2 emissions of just 56 g/km slot it into a very affordable 13% tax bracket. However, you need to bear in mind that it will be no more fuel-efficient on a motorway journey than a V6 petrol car (possibly worse because of the extra weight) and it certainly doesn’t drive with the same dynamic brilliance as the rest of Turismo range. The diesel is our particular favourite, as it's devilishly quick, yet still has an official combined fuel economy figure of 41.5mpg. The Turismo is far too new for any reliability data to have been collected and there's not even any information on the Panamera available, but Porsche as a manufacturer sits almost at the bottom of the Warranty Direct Reliability Index, which ranks carmakers. 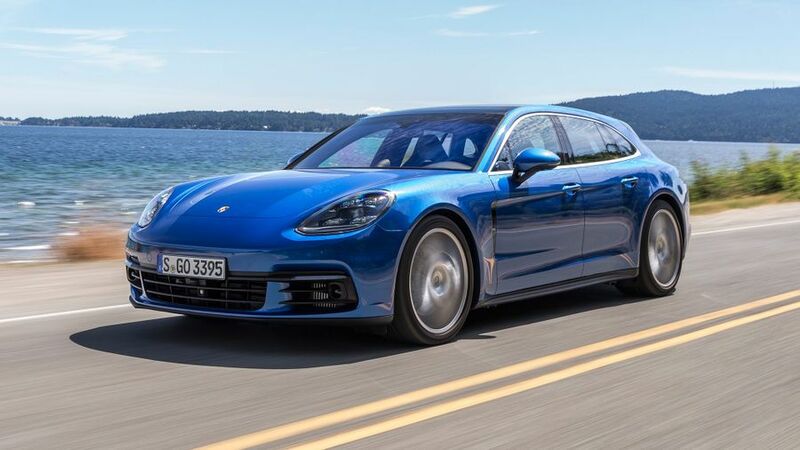 Having said that, the Panamera's main rivals are also from manufacturers that don’t have a particularly rosy reputation for reliability, either, with Bentley, Jaguar, Mercedes-Benz and BMW all languishing in the bottom half of the table as well. Repair costs are likely to be sky-high for any problems, and although Porsche only provides a three-year warranty it is at least unlimited-mileage cover. Neither the Turismo, nor the Panamera it is based on, have been crash tested by safety organisation Euro NCAP, but it’s reassuring to know that the last Porsche tested – the Macan SUV – scored a maximum five stars. Every Turismo comes with driver, passenger, curtain, knee and front side airbags, as well as an 'active' bonnet that pops up to protect pedestrians in the event of a collision. The outer rear seats also have Isofix points for child seats, and you can opt for an additional set in the front passenger seat. All cars come with climate control, remote central locking, and a leather-trimmed interior with electric seat adjustment and all-wheel-drive. Then again, at this sort of money, you’d be asking some serious questions if they didn’t. 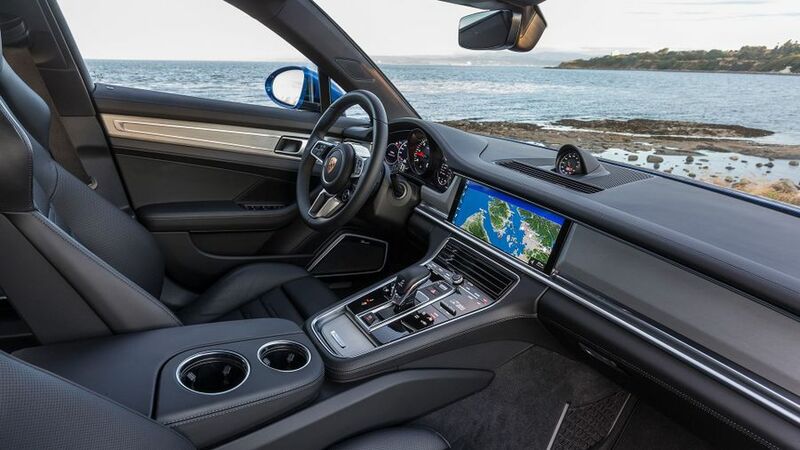 You also get Porsche’s Communication Management infotainment system with navigation, Apple CarPlay and internet access, as well as Porsche Car Connect, which lets you monitor and control various systems on the car from a smartphone app. Every Turismo also gets at least a 10-speaker sound system, while Turbo models get a standard upgrade to a Bose system with 14 speakers. From here on, it’s just a question of how much do you want to spend. As you’d expect, the options' list on the Turismo range is pretty extensive and Porsche certainly knows how to charge for any additional fripperies you might fancy. Let’s not dress this up; despite Porsche's claims that the Turismo is a more practical and more versatile vehicle than the Panamera, the differences between the two cars are marginal. Yes, you’ll get a bit more rear headroom and a bit more boot space in the Turismo; and, if you can actually convince someone to sit in the painfully thin middle rear seat, you can just about justify your choice on passenger-carrying potential. Really though, chances are you’ll buy the Turismo simply because it’s a more handsome car than the Panamera, and despite the fact that it’s very expensive compared to other luxury offerings. In terms of driving, there’s nothing to separate the two, which is just as well. Providing you steer away from the 4 E-Hybrid, the performance, comfort and luxury of the Turismo ensure it’s one of the best luxury sport cars that money can buy.